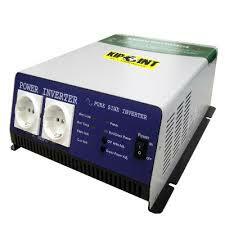 We are pleased to add low-frequency inverters to our catalogue. The top solution to completely replace a high quality conventional electricity by the same quality power supply. The price you would pay for a low frequency inverter over a high frequency inverter should be considered a long term investment, given how unlikely the low frequency inverter is to break down. They are indeed bigger, stronger, and tougher. Low-frequency inverters have the advantage over high-frequency inverters in two fields: peak power capacity, and reliability. Low-frequency inverters are designed to deal with higher power spikes for longer periods of time than high-frequency inverters. Power spikes can occur for a number of reasons (e.g. devices like power tools, pumps, vacuum cleaners and other appliances with electric motors require high starting power); when inverters experience such spikes, they can endure the increased power for a short period of time before shutting down in order to prevent any damage being done to them. Low-frequency inverters have much greater peak power capacity to handle large loads with power spikes than high-frequency inverters. In fact, low-frequency inverters can operate at the peak power level which is up to 300% of their nominal power level for several seconds, while high-frequency inverters can operate at 200% power level for a small fraction of a second. The second main difference is reliability: low-frequency inverters operate using powerful transformers, which are more reliable and sturdy than the high-frequency inverter’s MOSFETs, which use electronic switching and more prone to damage, particularly at high power levels.